Flu vaccines are available at the Health Center every Tues.-Fri. 8:30-10 am. You can help prevent the spread of Seasonal Influenza. Detailed and frequently updated information about Seasonal flu. There has been a significant increase of influenza in Washington State. The predominant circulating virus is currently H1N1 and is in this year's flu vaccine. This flu strain is the same virus that began in 2009 as "Swine Flu". This virus is unique in that it can rapidly cause serious symptoms in otherwise healthy young adults and as we saw in 2009, young adults are experiencing more serious complications than with other flu strains. We want to get the message out to our campus community that it’s not too late to get vaccinated. The Health Center has about 50 doses of flu vaccine left. We offer flu vaccine in the Health Center and will be offering a flu shot clinic and Prevention Convention in the lobby of the LIB next Wednesday, Jan. 16th from 1-3 pm. If you haven’t had a flu shot yet, please come get one. While reports indicate that this year’s vaccine is highly effective against this year’s flu, some people who became ill with the flu had been vaccinated. Those who had received the vaccine prior to getting the flu had milder symptoms, so please get vaccinated. People with a fever of over 1000 F with a sore throat and/or cough should stay home and limit exposure to others. Once you have been fever-free (without fever reducing medicines) for 24 hours you should be able to return to work or school. There has also been a nasty stomach virus circulating that causes 1-3 days of nausea, diarrhea and vomiting. Many of these gastro-intestinal illnesses are highly contagious and people can shed the virus for 24-48 hours after the vomiting stops. So again, we encourage those that are sick to stay home, and avoid returning to work or school until 2 days after the vomiting stops. Cover your mouth and nose with a tissue when you cough or sneeze. If you don't have a tissue, cough or sneeze into your elbow or shoulder, not into your hands. Avoid touching your eyes, nose, or mouth; germs are spread this way. Wash your hands often with soap and water, especially after coughing or sneezing. Alcohol-based hand cleaners also are effective, especially when soap and water are not available and after contact with commonly-used surfaces. You may want to carry a small container of hand sanitizer with you. Frequently clean your home or living quarters. If you live with others, you should frequently clean commonly-used surfaces such as doorknobs, refrigerator handles, remote controls, computer keyboards, countertops, faucet handles, and bathroom areas. Talk with your health care providers about whether you should be vaccinated for seasonal flu. Know the signs and symptoms of the flu. Symptoms of flu include fever or chills and cough or sore throat. In addition, symptoms of flu can include runny nose, body aches, headache, tiredness, diarrhea, or vomiting. A fever is a temperature taken with a thermometer that is equal to or greater than 100 degrees Fahrenheit or 38 degrees Celsius. Look for possible signs of fever: if the person feels very warm, has a flushed appearance, or is sweating or shivering. Plan to monitor your health by checking for fever and other symptoms of flu. If you have flu or flu-like symptoms, stay home (do not go to class or work) for at least 24 hours after you no longer have a fever or signs of fever. This should be determined without the use of fever-reducing medications (any medicine that contains ibuprofen or acetaminophen). If you are experiencing severe symptoms, call your health care provider. Students can also call the Evergreen Student Health Center (360-867-6200). Severe symptoms include increased fever, shortness of breath, chest pain or pressure, fast breathing, bluish skin color, vomiting, dizziness or confusion. It’s always best to call first before going in. For the most up-to-date information on flu, visit www.flu.gov, or call 1-800-CDC-INFO (232-4636). Know the signs and symptoms of the flu. Symptoms of flu include fever or chills and cough or sore throat. In addition, symptoms of flu can include runny nose, body aches, headache, tiredness, diarrhea, or vomiting. If you are experiencing severe symptoms, call your health care provider. Students can also call the Evergreen Student Health Center. Severe symptoms include increased fever, shortness of breath, chest pain or pressure, fast breathing, bluish skin color, vomiting, dizziness or confusion. It’s best to call first before going in. If you are sick with the flu, below are some tips on how to take care of yourself and to keep others healthy. Know the signs and symptoms of flu. Symptoms of flu include fever or chills and cough or sore throat. In addition, symptoms of flu can include runny nose, body aches, headache, tiredness, diarrhea, or vomiting. Stay home or at your place of residence if you are sick for at least 24 hours after there is no longer a fever (100 degrees Fahrenheit or 38 degrees Celsius) or signs of a fever (have chills, feel very warm, have a flushed appearance, or are sweating). This should be determined without the use of fever-reducing medications (any medicine that contains ibuprofen or acetaminophen). Staying away from others while sick can prevent others from getting sick too. Ask a roommate or friend to check up on you and to bring you food and supplies if needed. Cover your mouth and nose with a tissue when coughing or sneezing. If you don't have a tissue, cough or sneeze into your elbow or shoulder, not into your hands. Avoid touching your eyes, nose, or mouth; germs are spread this way. Sick people should stay at home or in their residence, except to go to the health care provider's office. Stay in a separate room and avoid contact with others. If someone is caring for you, wear a mask, if available and tolerable, when they are in the room. Drink plenty of clear fluids (such as water, broth, sports drinks, and electrolyte beverages) to keep from becoming dehydrated. Contact your health care provider or institution’s health services if you are at higher risk for complications from flu for treatment. People at higher risk for flu complications include children under the age of 5 years, pregnant women, people of any age who have chronic medical conditions (such as asthma, diabetes, or heart disease), and people age 65 years and older. With H1N1 flu, young people under the age of 24 may also be at higher risk for complications. If you experiencing severe symptoms, call your health care provider. Students can also call the Evergreen Student Health Center. Severe symptoms include increased fever, shortness of breath, chest pain or pressure, fast breathing, bluish skin color, vomiting, dizziness or confusion. It's best to call first before going in. For more information about flu, call 1-800-CDC-INFO or visit www.flu.gov. 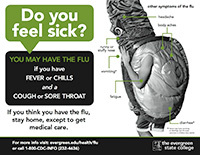 Living in a Residence Hall or an off-campus house or apartment in close proximity with roommates and housemates will be difficult if you or they have the flu. Here are some tips to help you get through a case of the flu. Cover your mouth and nose with a tissue when you cough or sneeze. Throw the tissue in the trash after you use it. If a tissue is not available, cough or sneeze into your sleeve or shoulder. Washing your hands and the hands of your children often will help protect you from germs. Germs are often spread when a person touches something that is contaminated with germs and then touches their eyes, nose, or mouth. Clean your home or living space frequently. You should frequently clean commonly used surfaces such as doorknobs, refrigerator handles, remote controls, computer keyboards, countertops, faucet handles, and bathroom areas. Avoid close contact with people who are sick. When you are sick, keep your distance (a 6 ft space away) from others to keep them from getting sick too. Stay home from work, school, and errands when you are sick. Keep sick children at home. You will help prevent others from catching the illness. Stay home until your fever is under 100° F for 24 hours or more without the use of fever-reducing medication. Some people with an influenza diagnosis will not have fever. In this case, absence of fever does not mean absence of infection. Stay away from others during this time even if you are taking anti-viral medication for flu. Pair up with someone and make arrangements to care for each other if one or the other of you becomes ill. If you live on campus, ask you RA to help you find someone. Use a surgical mask when close contact cannot be avoided. If close contact with others cannot be avoided, and you are ill, you should wear a surgical mask during the period of contact. An example is being cared for by a "flu buddy" or a family member. Kissing and sharing drinking or eating utensils should be avoided. Can I get a sick meal? Yes. If you have the flu you can have your "flu buddy" (usually your roommate) pick up a Sick Meal from the Corner Store in the Housing Community Center (HCC). You will need to email your flu buddy with your "A" number giving them permission to charge your meal plan (if you don’t have a meal plan we will bill your student account) for your meal. Example email: "Joe Smith has my permission to pick up a sick meal for me and charge it to my meal plan or student account. My A number is A000123456. This permission is valid for one week from today." Have your flu buddy print your permission email and bring a copy to the Corner Store to pick up your sick meal. The meals will include items such as soup, crackers, beverages and other items that may be easier to eat when you aren’t feeling well. Should I go to my family home? If possible, residential students with flu-like illness who have families who live relatively close to campus should consider returning to their family to keep from making others sick at the College. Try to do so in a way that limits contact with others as much as possible (private car or taxi vs. public transportation). Q. As a parent of a student who attends an institution, should I bring them home? If possible, residential students with flu-like illness whose families live relatively close to the campus should go home to self-isolate. They should return home in a way that limits contact with others as much as possible. For example, travel by private car or taxi would be preferable over use of public transportation. They should stay away from other people until at least 24 hours after they no longer have a fever (100 degrees Fahrenheit or 38 degrees Celsius) or signs of a fever (have chills, feel very warm, have a flushed appearance, or are sweating). This should be determined without the use of fever-reducing medications (any medicine that contains ibuprofen or acetaminophen). If flu severity increases, students at higher risk for flu complications including students, faculty, and staff with certain chronic medical conditions like heart disease, diabetes, or asthma, or who are pregnant may consider staying home while flu transmission is high in their institution community. Currently, the CDC is not recommending removing healthy students from their institutions. Q. Should my child who is a student at an institution get antiviral medicine if they get sick? Parents should make sure their child knows if he or she is at higher risk for flu complications. People at higher risk for flu complications including students, faculty, and staff with certain chronic medical conditions (such as asthma, heart disease, or diabetes) who become sick with flu-like illness should call their health care provider as soon as possible to determine if they need antiviral treatment. Parents should encourage sick students who are at higher risk for flu complications to seek early treatment. Early treatment with antiviral medicines often can prevent hospitalizations and deaths. Antiviral medicines are not given to all people during flu season because most people get better on their own, over-use can promote antiviral-resistant viruses, and administration of antiviral medicines can cause adverse reactions in some people.